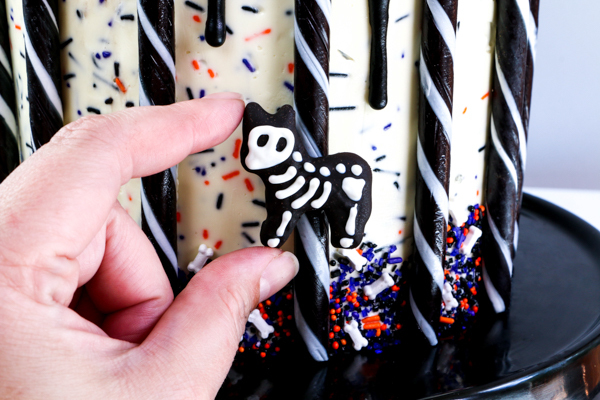 Animal Skeleton Cake – a carousel cake full of spooky animal cracker skeletons, with a playful sugar skull vibe. A new Halloween / Day of the Dead tutorial by our contributor Erin Gardner. Halloween is my favorite holiday, because it’s all about having fun. I love cutesie-spooky things and tend to shy away from the more realistic and gory side of the day. This is why I’m going to ask you to come along with me and take some artistic liberties when it comes to skeletal accuracy. I typically love to research my topic ideas in order to work as accurately as possible. That was so not going to happen here. Googling animal skeletons? No thanks! I did my best. Lines and dots and hip blobs will have to do. As long as you leave an eye hole in your skull blob and add some ribs, the general idea comes across. 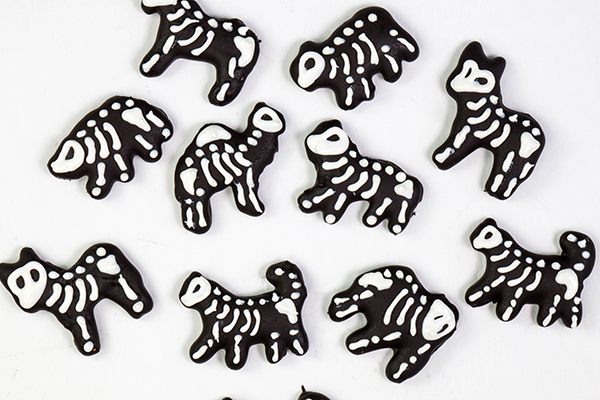 Maybe these aren’t actual animal skeletons? Maybe they’re animals wearing skeleton costumes they bought online. It’s Halloween, so anything goes! 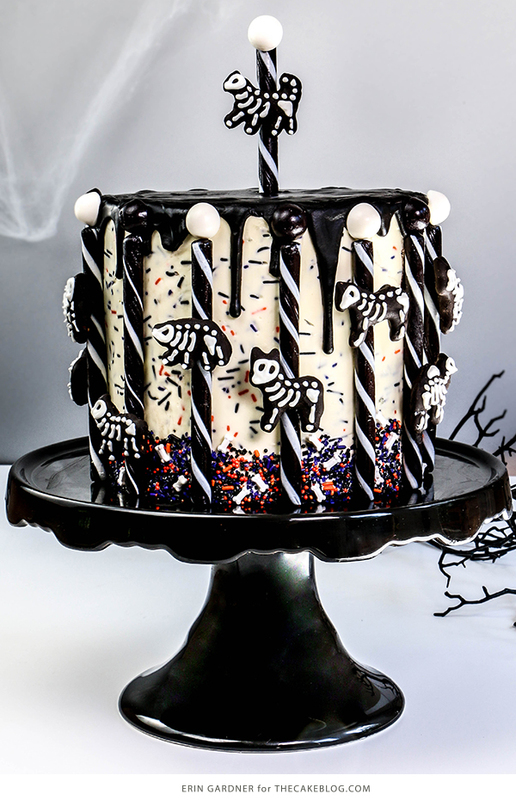 This cake also works for The Day of the Day, Dia de los Muertos, because it definitely gives off a sugar skull vibe, minus the brightly colored detailing on the skeleton itself. 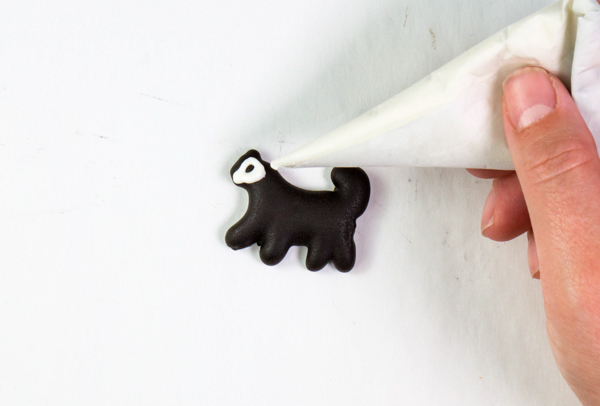 While orange and purple sprinkles give this cake a pop of color, you could always add a small flower or scrollwork to make these animals more festive. 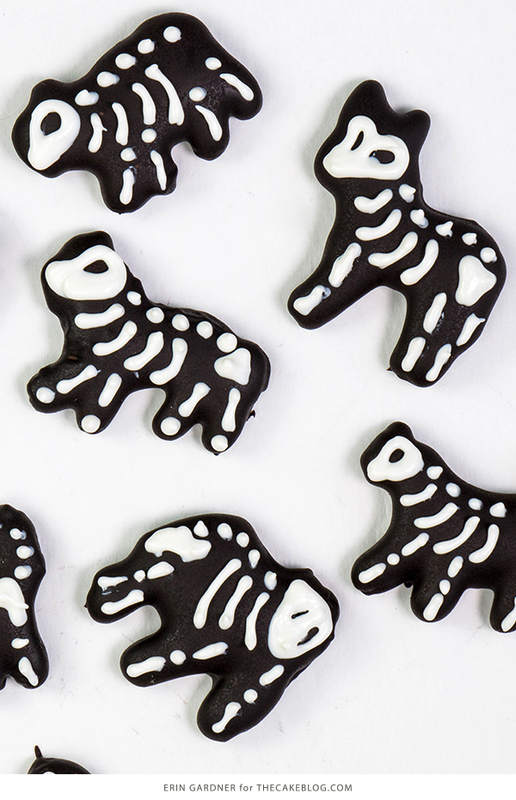 If your low-key holiday doesn’t require a full layer cake, just serve the skeleton cookies on their own or as cupcake toppers. 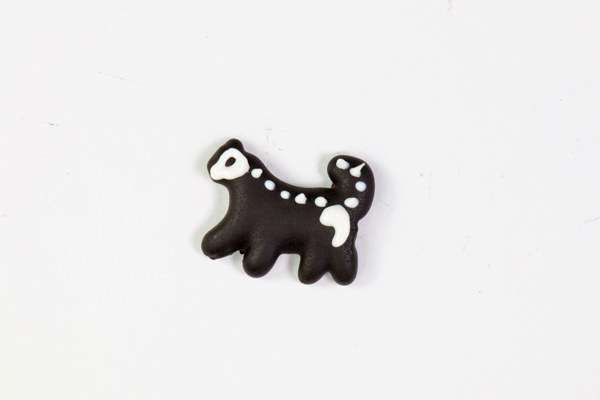 These fun little critters would also be the perfect finishing touch to a creepy circus or haunted jungle cake. If you’ve flipped through my book, Erin Bakes Cake, you may have already seen the rainbow unicorn version of this carousel. 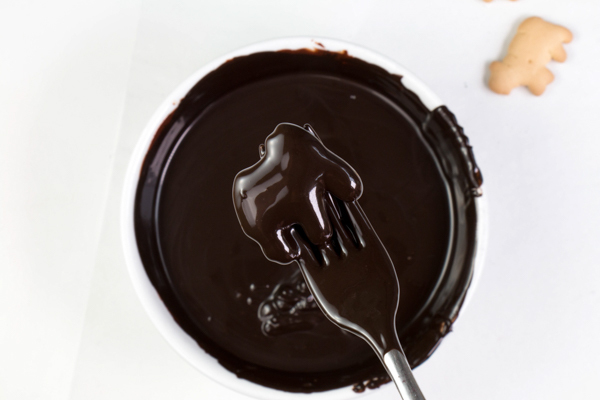 Melt half of the dark chocolate or black coating chocolate in a heatproof bowl. I picked traditional chocolate for this project, because I prefer the flavor when dunking cookies. If you’re using dark chocolate too, you can opt to stick with the deep brown color or tint it black like I did using powered food coloring or black cocoa butter. 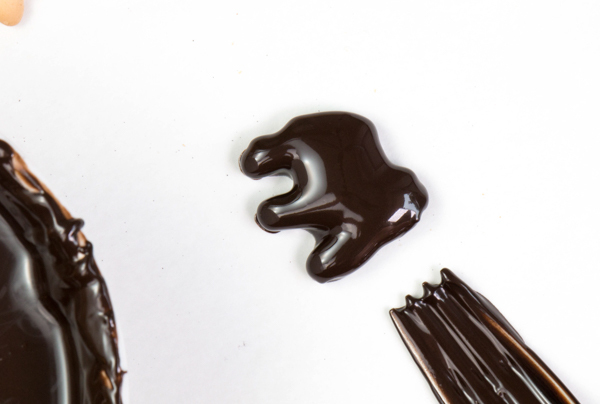 Water-based food coloring will cause the chocolate to seize. Keep in mind that you’ll need to temper chocolate couverture. 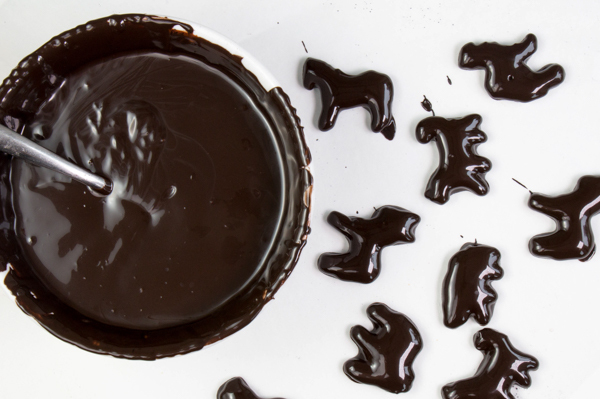 If time isn’t on your side, stick with coating chocolate and just melt and go! 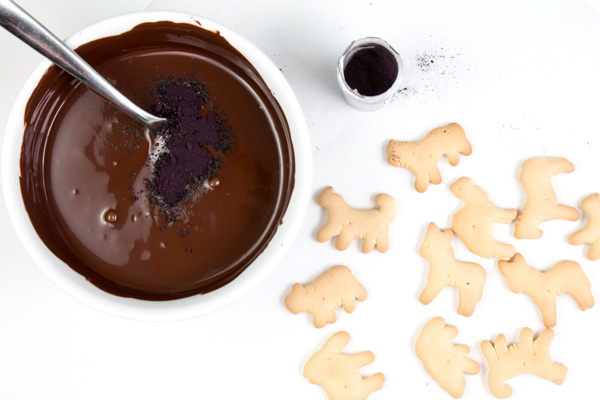 Dip animal crackers in the melted chocolate one at a time. Lift the cracker out of the chocolate with a fork. 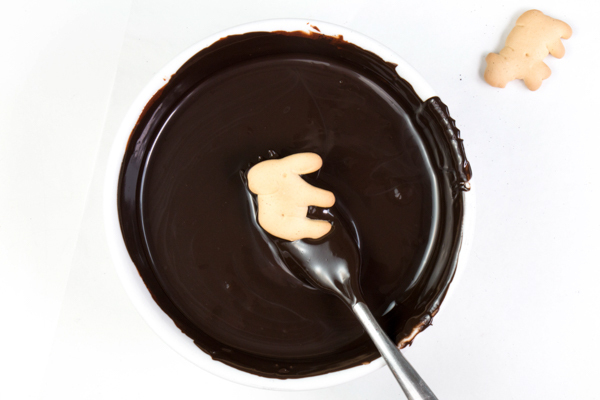 Tap the fork against the lip of the bowl to shake off excess chocolate. Slide the coated cracker onto a piece of parchment paper to dry. If a small puddle starts to form around the cookie, just move it to a clean spot. Repeat with at least 15 animal crackers, or as many as you like. Set the coated cookies aside to set up, at least 10 minutes. While the cookies are hardening, melt the white chocolate in a small heatproof bowl. Pour it into a paper cone or small piping bag. 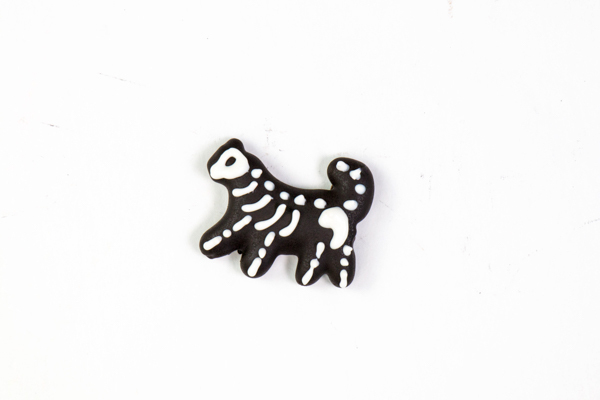 Pipe scarily accurate or fiendishly funny skeletal details onto each of the animal crackers. Set the finished animals aside until all of the chocolate has set up, about 10 more minutes. Save the piping bag filled with chocolate to help with final assembly. 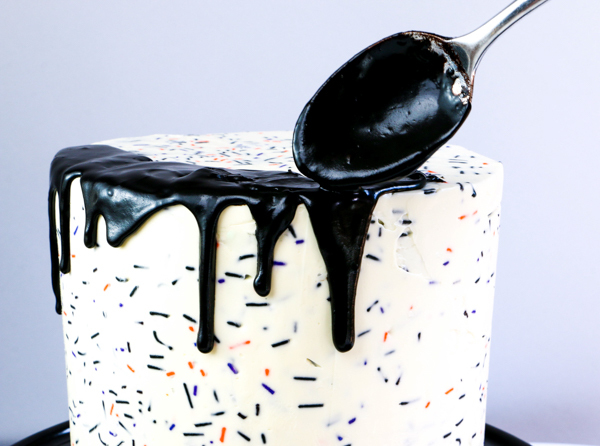 Stir the cup of black, purple, and orange sprinkles into the plain buttercream. Traditional, stick-shaped “jimmies” work best with this technique. 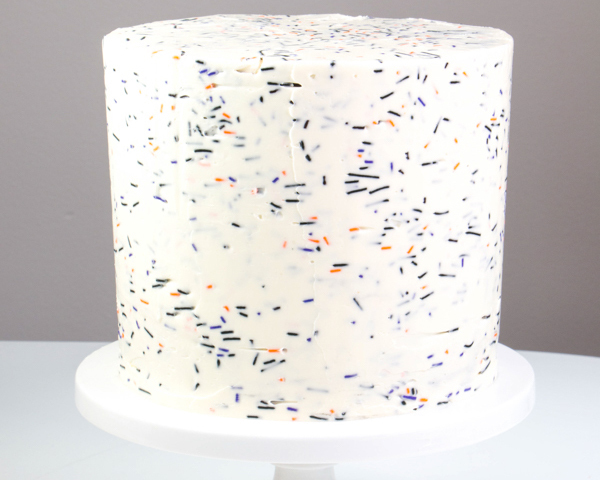 Finish the top and sides of the cake with the sprinkle buttercream just like you would any other cake. 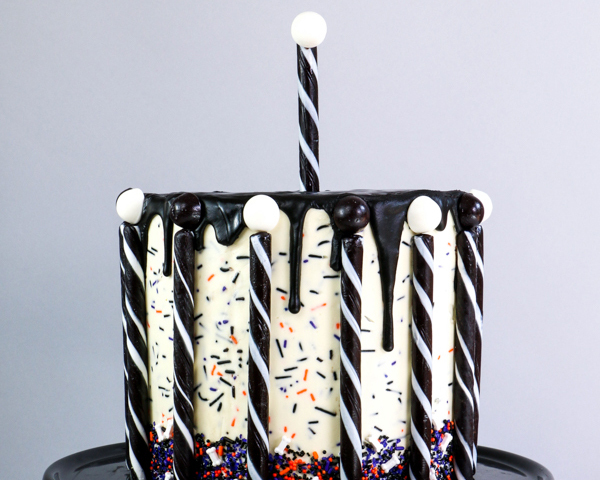 Slide a sheet pan under the cake to catch runaway sprinkles. 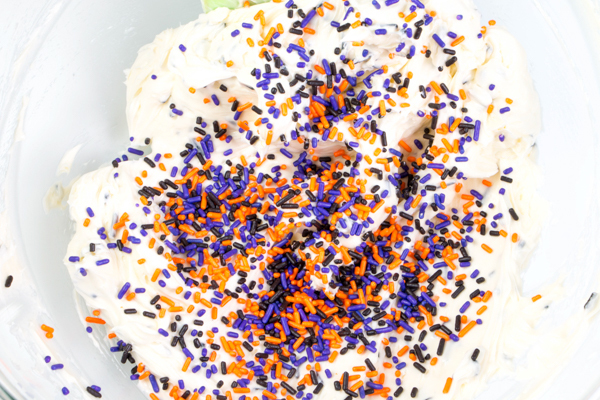 Scoop up your mix of Halloween sprinkles a handful at a time and press them into the sides of the call all around the bottom edge. 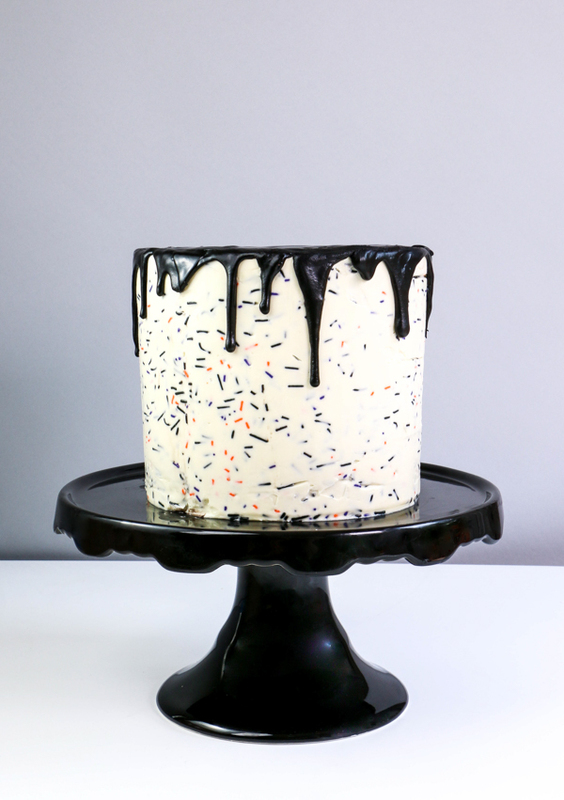 I created my own sprinkle mix with a random assortment of black, orange, and purple sprinkles from my stash along with a few sprinkle bones for good measure. 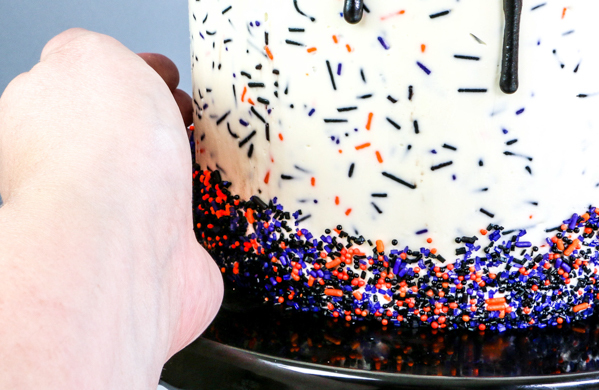 If you’re not a sprinkle hoarder, like me, there are a number of places online where you can purchase ready-made Halloween sprinkle mixes. Pop the cake in the fridge to chill thoroughly before adding the drip. Combine the rest of the dark chocolate or black coating chocolate and heavy cream in a small bowl. 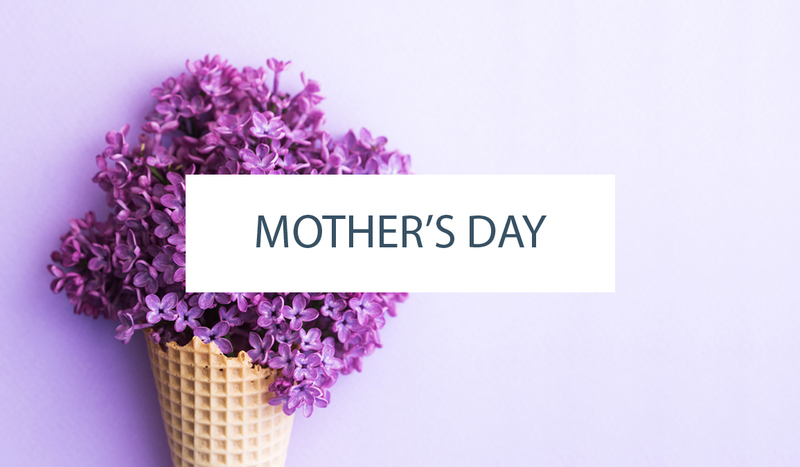 Heat the bowl in the microwave or over a double boiler until the chocolate is mostly melted. Remove from heat and stir until smooth. 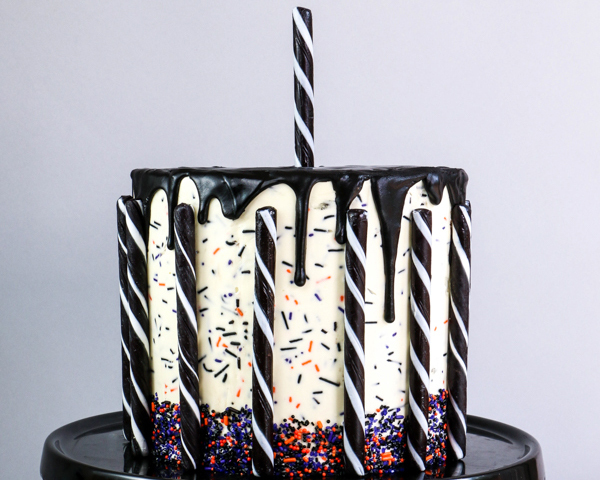 Tint the ganache black at this point with black powdered food coloring. I find this method of making ganache easier (as opposed to boiling the cream separately) when dealing with small quantities. Pour spoonfuls of ganache over the top edge of your chilled cake and let the mixture run down the sides. Fill in the top of the cake with the remaining ganache. 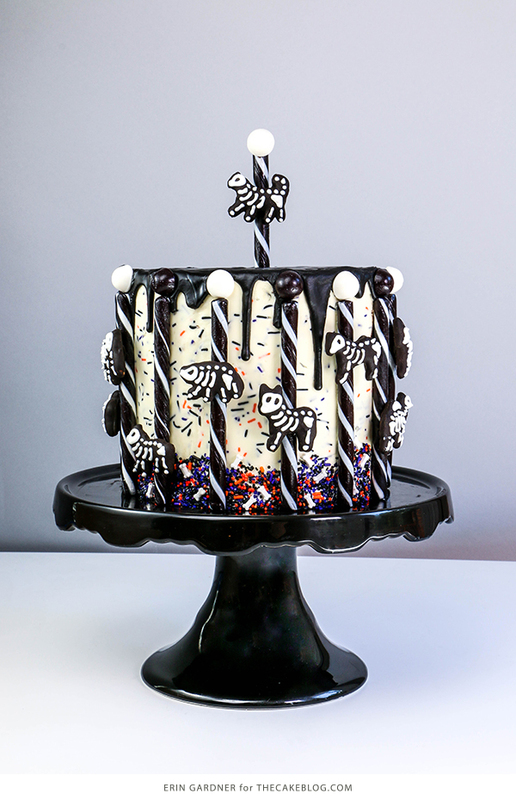 See my full tutorial for making the perfect drip cake here. 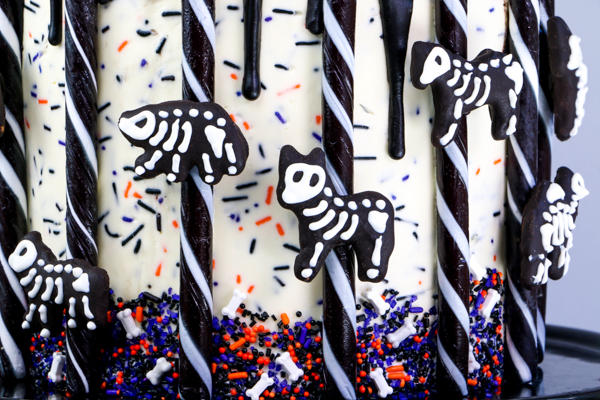 Press black and white candy sticks evenly spaced all the way around the cake. 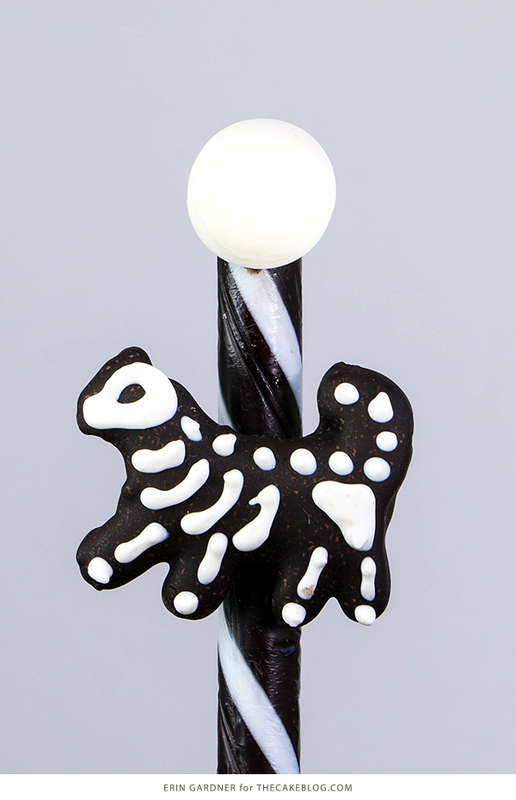 Top each of the sticks with either a black or white licorice drop, alternating the colors. Add the final stick to the top of the cake. 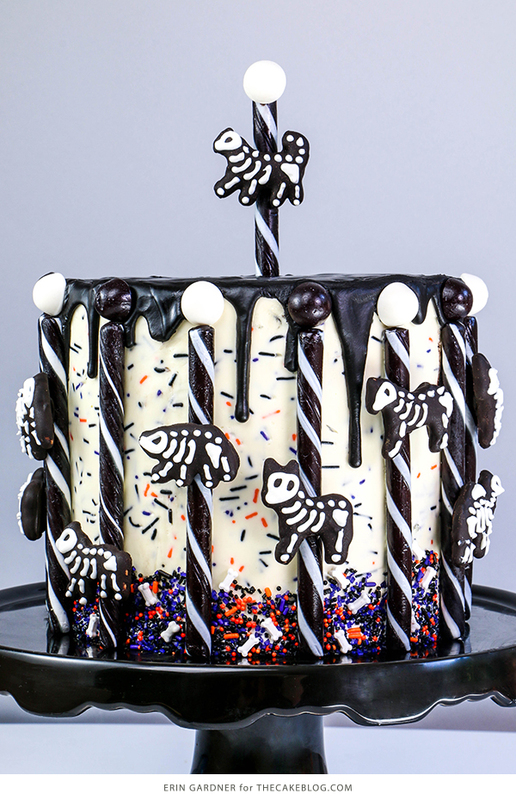 Use dabs of melted chocolate to adhere the animal skeletons to each of the candy sticks and a licorice drop to the stick on top of the cake.